New Liturgical Movement: Latin OF Mass for the Exaltation of the Cross at St Paul’s Cathedral, Worcester, Mass. Latin OF Mass for the Exaltation of the Cross at St Paul’s Cathedral, Worcester, Mass. On Monday, September 14, the Feast of the Exaltation of the Holy Cross, at 7:00 p.m., a Mass in the Ordinary Form will be celebrated in Latin, ad orientem, by the Very Rev. Msgr. Robert Johnson, at the Cathedral of Saint Paul in Worcester, Massachusetts. The cathedral is located at 38 High St. in Worcester; please click this link for parking information. 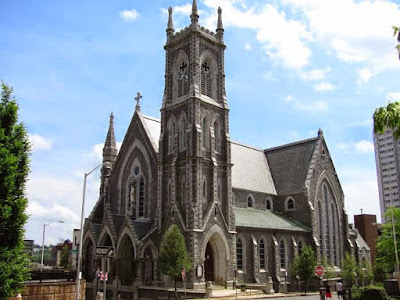 Music will be provided by the choir of St. John, Guardian of Our Lady Parish in Clinton, Massachusetts, under the direction of Marc DeMille. For more information, please contact the Cathedral of St. Paul or Lucas LaRoche.